The Olympus 27MG is an affordable ultrasonic thickness gage designed to make accurate, measurements from one side on internally corroded or eroded metal pipes, tanks, and other equipment. It weighs only 12 oz. (340 g) and is ergonomically designed for easy, one-hand operation. Despite its compact size, the 27MG has many innovative measurement features utilizing the same technologies that are available on our more advanced thickness gages. The durable, rugged 27MG is battery-operated and features a large, backlit LCD with easy-to-read numerals, and an intuitive color-coded keypad with direct access to many key features. Standard features include Automatic Probe Recognition to ensure optimal transducer performance, Auto Zero compensation to enhance the accuracy of measurements on hot surfaces, Gain Adjust to improve measurements on sound-attenuating materials such as cast metals, Differential mode, Hi-Low Alarm settings, and a Min./Max. mode that captures the minimum or maximum thickness at 20 measurements per second. The 27MG is designed for inspectors and maintenance engineers that need to monitor the wall thickness in metal pipes, tanks, beams, and structural supports that are susceptible to corrosion on the inside surface. 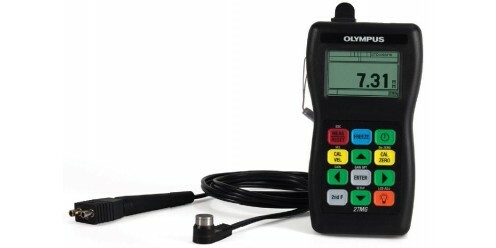 An ultrasonic thickness gage provides a quick, cost-effective solution by transmitting sound into the material from the outside, making it unnecessary to damage the part. The 27MG comes standard with the low-cost D7910 dual element transducer that enables you to make thickness measurement for many basic corrosion applications. For measurements on very thin or thick materials, or small diameter pipes, Olympus has available a full line of dual element transducers. Olympus transducers compatible with the 27MG feature Automatic Probe Recognition that optimizes transducer performance by automatically recalling the default V-path correction. Showing its commitment to D-STAR, Icom have now released its next generation model in the form of the ID-31E UHF D-STAR Digital handportable. One of the things that instantly strikes you about this new model is how sleek and lightweight it is. But donít let size fool you...inside the ID-31E is an integrated GPS receiver and fully functional D-Star radio. This gives you the capability to communicate across the globe using the D-Star network but also to track and display GPS information including position, altitude and movement. The built-in GPS receiver shows your current position and altitude on the display and offers a position reporting function in DV mode. The GPS log function stores your position information at regular intervals (1 secondñ60 seconds, depending on the setting) and memorizes this in the micro SD card to export to your PC. In addition, the GPS-A mode assists in easy D-PRS mode operation. The ID-31E is a true palm sized 5W radio. It measures only 58◊95◊25.4mm and weighs only 225g (approx.) with battery pack and antenna. The ID-31E provides superior waterproof protection equivalent to IPX7 (1m depth of water for 30 minutes) making it suitable for harsh outdoor environments. The ID-31E is Icomís latest D-STAR model providing digitally modulated clear voice, quiet stand-by, individual calling using a call sign and access to the world wide D-STAR network. When used with a micro SD card (Up to 32GB), you can record, play incoming and outgoing calls, and store various contents including GPS log data, memory channels, D-STAR repeater memories and other personal settings. Used with the CS-31 software (which is supplied with this model), memory channels, D-STAR repeater memories and personal settings can be customised. The ID-31E features a large full dot-matrix display with easy-to-read characters. The directional keypad and quick menu button provides quick and intuitive access to many settings and speeds up operation. The backlit LCD and keypad is especially useful for night time operation. Using the GPS position information, the automatic repeater list function shows the list of nearby D-STAR repeaters from the memory* and helps you to access the nearby D-STAR repeater. * To use the automatic repeater list-up function, the position data of the repeater is required. The ID-31E will be shipped with D-STAR repeater memories pre-programmed, but the position data of some D-STAR repeaters may not be available. The ID-31E has a total 1252 memory channels (including 500 regular channels, 700 D-STAR repeater (DR) memories, 50 scan edges and 2 call channels) with 26 memory banks. All memory channels, program scan can edges and memory banks can be allocated an 8-character channel name. Using a highly-efficient PA amplifier, the ID-31E generates 5W of RF output power. The supplied BP-271 provides up to 4.5 hours* of operating time, and the larger optional BP-272 battery pack, provides up to 7.5 hours* of operating time. When you don't need full power operation, you can reduce output power to 2.5/0.5/0.1W thus saving battery life. The CS-31 cloning software* is supplied with the ID-31E and allows you to customise various settings including the memory channels, D-STAR repeater memories and other settings can be made from a PC. The latest version of the CS-31 will be available from the Icom web site. * Either optional OPC-2218LU USB cloning cable or a micro SD card is required for transferring the data. An external DC power jack allows for operation with an external DC power supply (10ñ16V DC). When used with the CP-19R, CP-12L or OPC-254L/LR, simultaneous operation during charging is possible. * When more than 14V volts is applied, the power protection function reduces the output power to Mid level (2.5W). ï Squelch release function to monitor a weak signal.